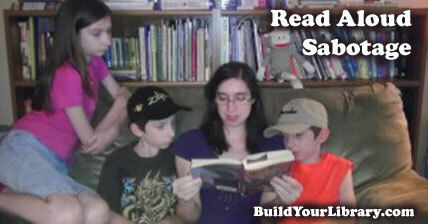 In case you just missed it, this past Thursday, February 16th was World Read Aloud Day. But I don’t believe we need a national day of recognition. Everyday can and should be a read aloud day! The picture to the right is in fact an actual picture perfect, but admittedly non-typical read aloud session at our house. It was taken several years ago… before an additional child, and somehow without an attention seeking dog getting in the way… Although I am pretty sure he must be at my feet, cropped out of the picture. Nowadays, our read aloud sessions rarely look like this. With the exception of our yearly Night Before Christmas (and Zombie Night Before Christmas) reading on Christmas Eve. The above picture illustrates minimizing some common read aloud mistakes that can wreck havoc upon the greatest intentions. We had the right book, at the right time and everyone was in the right mood. Don’t necessarily force your child to stay still. The picture perfect scenario is great in the few and far between instances that it works. But I have found some alternate ways to sneak in some read aloud sessions. One way is to peg the read aloud to other activities that occupy but not overly distract children from paying attention. Breakfast (or lunch) is the perfect time to grab a book and read to your children. Typically they are a captive audience. They are sitting down, putting food in their mouths to prevent excessive chatter, and can easily accomplish both tasks at the same time. After they finish eating and clear the table, have them come back and sit down for a few minutes to discuss any topics of the reading that you want to cover, clarify and reinforce… before they take off in opposite directions. Another option would be to allow them to do another “mindless” task while you read them a chapter or two. You can try using a coloring book, Play-doh, Legos, Etch-a-Sketch, Lincoln Logs, sand box or any of another countless activities that they can perform but still pay attention to what you are reading them. Perhaps just a change of scenery will do the trick. Maybe you can abandon the living room couch and set up some lawn chairs in the backyard, head out to the swing set or picnic table or bring the book in the car the next time dad is driving and mom can read from the passenger seat. We have a 10 year age span in our household, so there are instances when we just can’t please all of the children, all of the time. There are certain books that will capture the attention of our 7, 14 and 17-year-olds all at once, such as the Hobbit, or Harry Potter… heck, even Where the Wild Things Are may make one of the teenagers linger. But the twin 14-year-old boys would be pretty restless during Anne of the Green Gables. So make sure you are inviting the right crowd for that particular sitting. 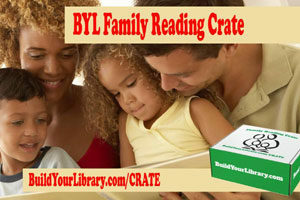 The choice of books is also important if you are specifically reading to one child at a time. If nostalgia is not kicking in, your child may no longer want to hear a book that is too elementary for their age. Even if it was once one of their favorites. There is also a fine line between reading a challenging book and reading a book that is simply too hard for them. Read aloud time is an excellent time to read a book to your child that is a bit advanced for them. It may make them pay closer attention, and expose them to a richer vocabulary if they have to use context clues to figure out the meaning. It may even promote a healthy discussion afterwards. But if you find yourself reading a book that is too advanced, it may overwhelm your child. It may cause their mind to drift, their body to fidget, or cause them to get up and wander away. If this is the case and they are struggling to listen, try that book again at a later time. Maybe with a few months or even a year break, they will be ready to tackle that story. Or try an adaptation. If, for example, you are studying ancient history with an 8-year-old and want to expose your child to Homer’s The Iliad, the original text will likely be way over their head. Luckily there are many fantastic retellings available. Why not try reading Black Ships Before Troy: The Story of ‘The Iliad’ instead. Sometimes offering a retelling or adapted version of a classic work for younger children makes it that much easier for them to tackle the real thing when they are older. They’ll be familiar with the storyline already, so grappling with complicated text or literary analysis will be that much simpler. Limit interruptions while actively reading. This relates to both reading a book that is too advanced and causes frequent interruptions to defining words and explaining situations to just simple questioning and discussions in the middle of the chapter. When at all possible, reserve all questions until the end. This will allow the story or chapter to unfold fully, possibly answering the questions itself, allowing context clues to sink in, and keep the flow of the passage intact. If you are reading a science book, stopping periodically would be fine to further explain topics and possibly discuss concepts as they come up. But interrupting during a literature read can ruin the story. It will not be the end of the world if you have to miss or reschedule a read aloud session once in a while. If your children are excessively wound up, send them outside to run around and play for half an hour, then come back and try to do some reading. Have them do you other independent school work and do some reading later. Keep it a regular activity, but keep the schedule flexible. And if you find yourself reading a book that no one is enjoying, by all means, stop reading it and choose a better book. Even books that have hundreds of 5 star reviews will bomb once in a while. Not everyone will love every book, and it is perfectly OK to stop reading something that your child isn’t enjoying. Forcing them through it just because they are “supposed” to read it will only leave a negative impression. One of the worst things you can do is force the issue and turn it into a chore or make it an otherwise unpleasant experience. I love this wonderful quote by Emilie Buchwald – “Children are made readers on the laps of their parents.” I truly believe this to be the case. Bonus Related Video: How to be a Read Aloud Superstar! I am a huge advocate of reading aloud to both younger children and teens alike, so I really hope your family read aloud sessions are as enjoyable and fulfilling as possible. Do you have any other creative ways to prevent wrecking read alouds? Let us know below in the comments!